The Waxy O’Shea’s Irish Pub is the only Irish pub and most exciting bar in Branson where friends come together to meet. Many of the locals and visitors alike that are dining in Branson never miss to taste a piece of Dublin with its authentic Irish atmosphere at Waxy O’Shea’s Irish Pub in Branson. This Irish pub offers the most variety of draft beers in town, and the spirits flow bountifully and generously. Everyone in this exotic Branson’s pub is exciting to mingle freely with the locals and visitors. Beautifully constructed in the historic downtown Branson, Waxy O’Shea’s Irish Pub is a unique bar that has been operating for almost a decade now. With the boost of bustling customer base, this Irish pub remains one of the most prominent bars in Branson, and still remains the only Irish pub in town. At Waxy’s, you’ll find an assortment of Irish liquor, from Guinness to Jameson, Smithwick’s to Killian’s. The feel of the Irish ambiance makes visiting the pub as if you’ve entered Dublin instead of Branson. 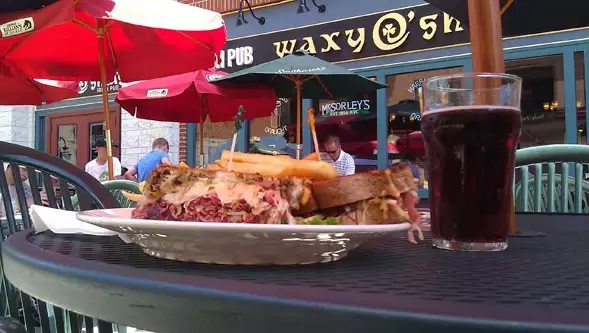 Waxy O’Shea’s features many exciting portions of the attraction such as the unbeatable Happy Hour specials, the impeccable food and drink menu, and the best live music offered inside the pub. So if you are coming from work, from another town, or from another part of the country, come and share the pub’s one-of-a-kind bar with the locals and visitors. In this pub, you can get the authentic Irish experience right in Branson. Waxy O’Shea’s is a perfect venue to hold any event, whether it’s an office party, a family reunion, or a casual get-together with friends, the pub provides the best dining venue in town. With its wide variety of tasty food menu, Waxy’s has something for everyone, and as the most all-encompassing bar in Branson, it guarantees every guest to enjoy the feel of the good times. Beautifully located at 235 Branson Landing and very near the historic Branson Scenic Railway and historic downtown Branson, “Waxy O’Shea’s Irish Pub & Restaurant,” is an ideal location to hang out with friends, or meet new ones. The pub offers outdoor seating to make it easy for guests to enjoy the small city-like atmosphere and watch the train leave the station. As the only Irish pub in Branson, so there’s going to have a taste of Dublin for most of its drink offerings, but there’s also an impeccable menu with traditional pub fare like burgers and fish and chips, and appropriately named items like the Donegal Club Sandwich and the Irish BLT. On select evenings, the pub may feature live music and a new Guinness Room for private parties. At Waxy’s, you are sure to enjoy Branson’s nightlight at Branson Landing promenade as the pub is located in a place where the spectacular Fountain Show will showcase a dazzling display of fire, geysers, and great music. Whether you’re dining in Branson to meet some friends or looking for a local bar to frequent, Waxy O’Shea’s Irish Pub is the place to go.